The Citadel series of Chemical Process Pumps are designed to be a highly economical specialized centrifugal pumping soultion for difficult pumping applications involving caustic and corrosive chemicals that would attack standard centrifugal pumps. The secret to the success of the Citadel Series is its specially designed thick-walled vacuum-proof single piece PVDF (Polyvinylidene fluoride) volute casing liner and internal wetted parts that can be used in contact with your corrosive, toxic and aggressive pumped elements with no negative effect to the pump. PVDF also holds strong resistance to cold-weather impacts to resisst shattering. This PVDF liner is held secureley within a cast Iron Armored shell surrounding the pump for protection from the elements and working environments as well as for absorbing forces from the pipe lines themselves. The Back Plate of the Citadel pump is also made from solid injection-molded PVDF as are the shaft sleeves for optimal performance under adverse operating conditions. Maintenence for the Citadel series is a standard "pull-back" design. The Citadel Series has a Stainless Steel drive shaft manufactured to tight tolerances of 0.05mm deflection at the mechanical seal which is well within international standards as well as standard operating conditions eg. heavy load conditions during startup, minimum flow rates, maximum impeller diameters and high density fluids. This tight tolerance in manufacturing also prevents leakage. The Impeller is of a Semi-open design and is manufactured of solid PVDF with a metal insert to greatly increase the strength of the piece. 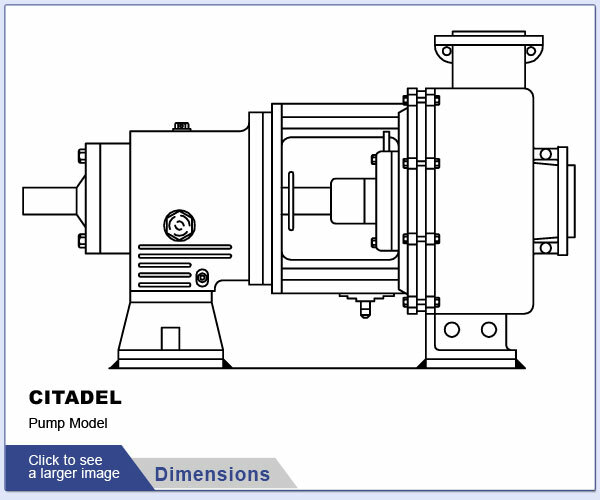 The standard shaft seal for the pump is a mechanical model with other options available depending upon your application. Internal sealing gaskets are made from PTFE. Additional EPDM rubber inserts ensure maximum sealing of the pump. The Bearing housing hlods double row ball-bearings with an extremely high load capacity. The Bearings are Long-life oil lubricated out of a internal resovoir in the bearing housing unit that holds the lubricating oil. Oil levels can be easily checked by a sight-glass that shows the available oil supply. 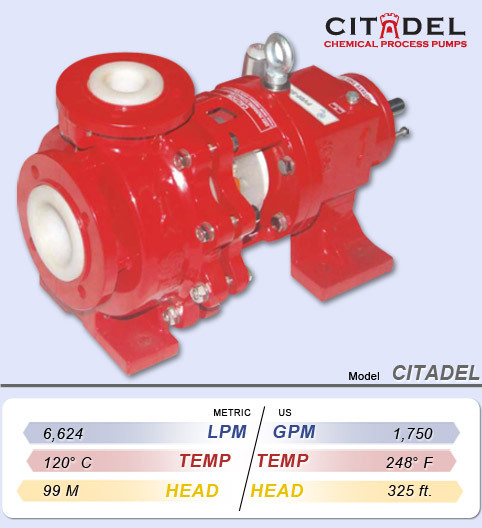 Shanley Pump and Equipment carries 20 sizes of the Citadel Series spanning in performance ranges up to 1,750 GPM with a Head up to 325 ft. The Citadel series also allows for higher than average pressures to be achieved pumping caustic chemicals. Be sure to ask your sales engineer for more information. Temperature resistance in the Citadel series extends to 120°C during standard pumping operations. The Citadel Series makes a great investment in affordable Chemical process Pumps for industry. Learn about our Iconology here. *Shanley Pump Group is not affiliated with nor distributor for Seepex®, Allweiler®, Moyno®, Tarby®, Netzsch®, or Continental Inc.® All referenced product names, brands, models, or part numbers is solely for identification purposes. Seepex® is a registered trademark of Seepex®. Moyno® and Tarby® are registered trademarks of Robins and Myers® and NOV®, Netzsch® Incorporated is a registered trademark of the Netzsch® Group, Allweiler® is a registered trademark of Colfax® Corporations Continental® Pumps is a Trademark of Continental® Ultra Pumps. 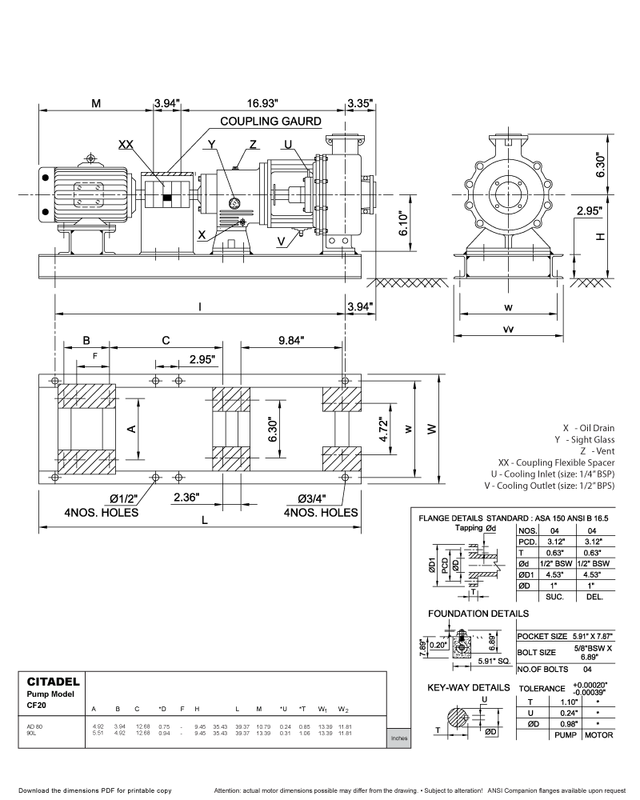 ©1988-2015 Shanley Pump and Equipment, Inc.